In the marketplace of Adrianople, the beautiful Medora is sold to Pasha by a slave dealer. But a pirate, hidden among the crowd with his companions, decides to ravish her. 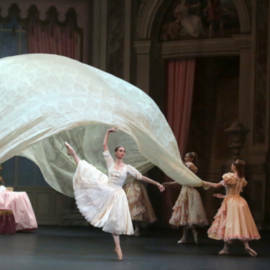 Inspired by Lord Byron’s poem, Marius Petipa’s version of the ballet was part of the Bolshoi’s repertoire until the beginning of the 20th century. In 2007 Alexei Ratmansky and Yuri Burlaka presented a new choreographic version, which stands out as the most sumptuous of all. Thrilling suspense is at the core of this lavish exotic fable, an amazing production complete with pirates, kidnapping, a shipwreck, and a record 120 dancers on stage.